Since the 16th century, Paris has been a leading arbiter of taste and the ultimate source of luxury goods for Europe and the world. 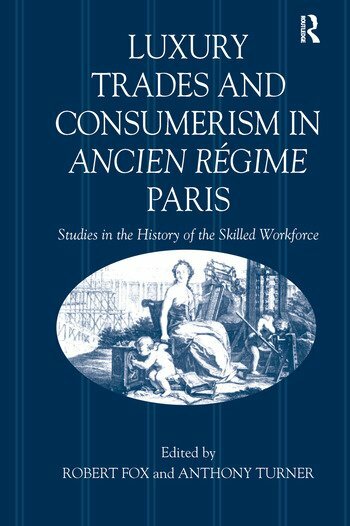 However, the origins of the luxury trades of Paris and their role in the wider economic development of France and Europe have been relatively little examined by historians. This volume provides an entry into some of the many questions raised by the growth of the luxury trades, by bringing together eight detailed case studies of specific trades with five more wide-ranging and theoretical contributions. It therefore offers both the results of entirely new research and a range of new perspectives and methodological reflections on the subject as a whole. Essential to economic and social historians of Early Modern France, the book will also be of interest to all students of material culture. Contents: Introduction; Robert Fox and Anthony Turner; Les relieurs et doreurs de Paris au XVIe siècle, Fabienne Le Bars; L’influence flamande sur l’orfèvrerie parisienne au XVIe siècle, Michèle Bimbenet-Privat; The Parisian fine-binding trade in the last century of the Ancien Régime, Giles Barber; Mathematical instrument-making in early modern Paris, Anthony Turner; The manufacture and marketing of luxury goods: the marchands-merciersof late 17th- and 18th-century Paris, Carolyn Sargentson; Paris-Lyon-Paris: dialogue in the design and distribution of luxury silks in the 18th century, Lesley Miller; NoÃ«l Gérard (1685-1736) et le Magasin Général Ã l’HÃ´tel Jabach, Jean-Dominique Augarde; La luxe par excellence: les fÃªtes royales de Louis XIV Ã Versailles de mai 1664, Jean-Jacques Gautier; Between a moral economy and a consumer economy: clothes and their function in the 17th and 18th centuries, Daniel Roche; Fashion’s empire: trade and power in early 18th century France, Michael Sonenscher; Luxury trades and consumerism, Joan Thirsk; Some remarks on the métiers d’art, FranÃ§ois Crouzet; Producers, suppliers and consumers: some reflections on the luxury trades in Paris, c.1500-c.1800, Gillian Lewis; Index.